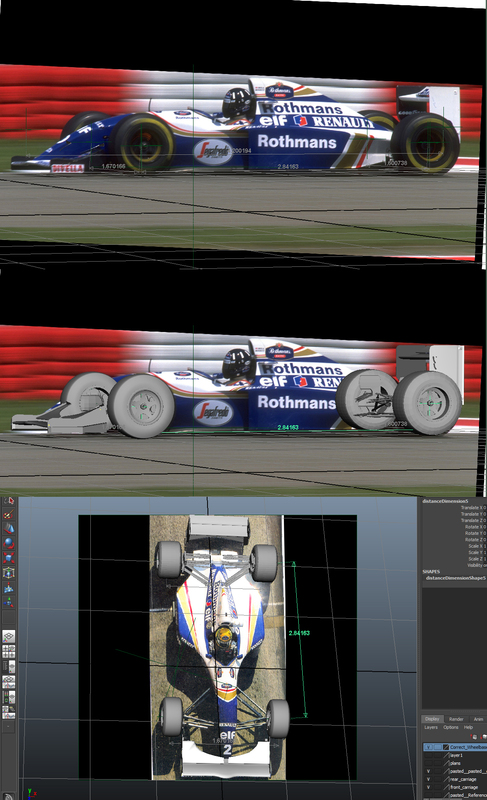 Radu did among others the attached photo comparison to find the correct wheelbase. The picture gives 2.84m,which is shorter than any of our sources. Unless we find something canon and concluding, we will probably opt for a compromise of 2.89m. I had absolutely no idea, doing properly scaled model requires such a drastic measures :O Kudos! Scaling is not easy without blueprints and unfortunately this has been a weakness on some of our mods and is also one of the reasons why we go through the big effort of checking, reviewing and even remodelling many models we have with wrong proportions. Superimposing the model onto photos seems to indicate that the wheelbase is quite short. So now you have a Romanian in your team…Good to see things are moving forward with this mod now that rF 2 is almost out.As always I see you guys pay a lot of attention to small details. The correct number for FW16B is 2920 mm, FW16 was shorter. What sources do you have? I model F1 cars, check out my project which I’ve just finished. I am now looking at seeing what I can do with the 1994 regulations. I am looking for the drawings which go with the written regulations (cockpit entry template etc…) do you have them? Good luck with the project, can’t wait to play this!